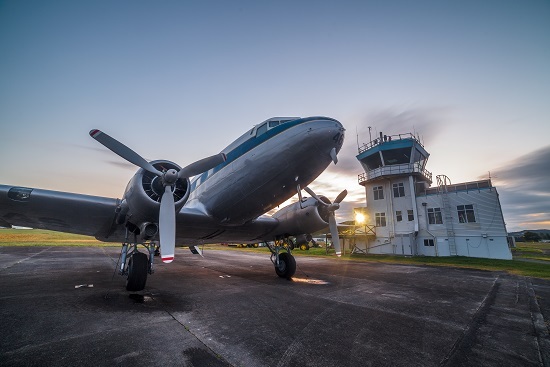 Our classic DC3 Airliner is available for private charter, for up to 28 passengers. For Corporates, Businesses, Schools , Staff groups, Churches, Rotary, Lions, Probus, Family and Friends, RSA, Retirement Villages, Special and notable Birthday celebrations, Bands, Sports teams, Car clubs, Yacht clubs, Golf clubs, Reward your Staff/Team. We offer Tea/Coffee, OJ ,other cold drinks and cookies when you arrive at our hangar. BYO cheese board and canapes if you wish, (or we can get them catered in) and our Cabin Crew will have it all presented and ready for your guests/clients before your flight.We advise that on scenic flights,that we don’t offer catering. You will have both hands occupied with taking photos and flight deck visits. 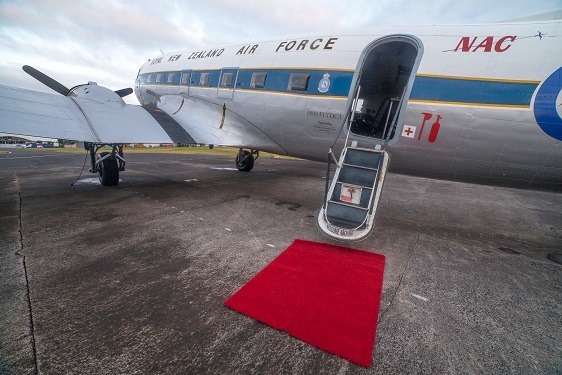 FLY DC3 New Zealand is a confirmed and established choice for businesses, incentive trips for top achievers, and extended family or friend groups to travel together. The aircraft accommodates 28 passengers for a day trip. For overnight charters we reduce the seating to 24/26 to allow for overnight bags and/or fuel payload. The crew includes two pilots ( an airline Captain and First Officer) as well as two professional Cabin Crew. 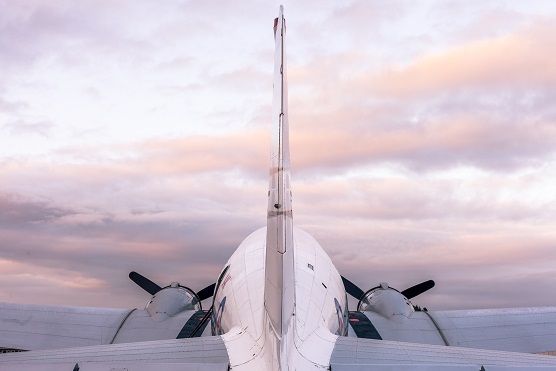 At the DC3 hangar there is free parking , refreshments available on arrival/check-in (in the corporate Dakota Room for around 12 -15 people, or in the hangar itself for 28 pax,) Other catering options are available, including canapes before the flight. South Island – Nelson, Blenheim,Omaka, Christchurch, Ashburton,Timaru, Oamaru, Dunedin, Invercargill, Te Anau/Manapouri, Queenstown, Wanaka, Hokitika, Westport. We work closely with Pacific Trailways (www.pacifictrailways.co.nz) to plan and manage all of the ground tours,options and ideas for side tours, accommodation and transport. For any South Island charters, options, ideas, prices – first contact us at [email protected] for availability. 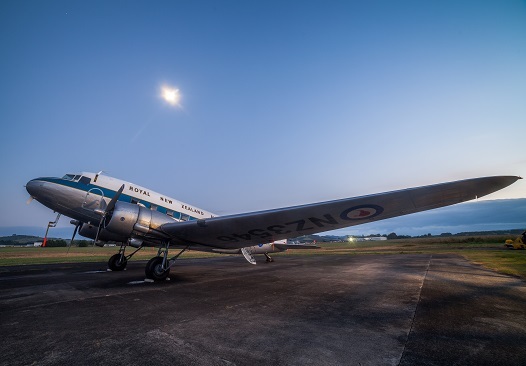 Whitianga Days out – DC3, Wine, Lunch! Our most popular private charter Day trip is the 25 minute flight beach destination of Whitianga. ($3,565+GST for the flights for 28 pax. Includes Landing and airways fees.Excludes lunch, etc.) Lunch in town (‘Stoked’ or ‘Salt’ or coach to the very Kiwi bach-style Pizza place at Kuaotunu Luke’s Kitchen.) Other restaurants and cafes will be added as we get to know them. Combined ‘public’ Whitianga Day Trips: 3-4 dates over the summer, we offer Day Trips to Whitianga – it only takes 20-25 minutes, instead of hours by road. Individuals, couples , families and groups who don’t have enough people to ‘fill’ their own charter, can book to join in on planned dates. January, February and March. Our passengers can book ahead to their restaurants or cafes of choice for lunch. Generally, check in at 0930, and after refreshments, departure is 1015. Arrive at the airfield at Whitianga at 1045. Transport will be waiting with a quick trip into town. There are so many cafes and restaurants to choose from. Our charter passengers usually choose ‘Stoked’ or ‘Salt’, or head up the coast to ‘Luke’s Kitchen’. A Must Do is visit the Bread and Butter Gallery www.breadandbutter.co.nz Also – the Lost Spring Spa, the local museum, a ferry ride to the other side…and one of the best beach and marina walks. Departure from town is usually a 3:30 pick up at the Gallery. Are there options and flexibility for other dates? A one–way trip? A day trip? A multi sector or at least 1 overnight? Where your passengers are coming from – ie: will they all arrive by coach or shuttle? Will they need car parking. Discuss ideas for activities at destination. From your initial ‘brief’ we will provide a number of solutions and ideas in a written quote, sent by email. It will contain Information and Terms and Conditions to allow you to make a decision about what options best suit you and your clients/guests. Prior to your arrival at our private Check-in facilities, we will confirm and provide you with all the information required for you and your clients/guests. This will include location and ‘How to find us’… directions and maps. Check in Time, Departure time, flight time, arrival times. Luggage restrictions – if any. Please note – we don’t operate at night / after Civil Twilight with charter passengers. There are pilot/aircraft activated runway lights at Ardmore for emergencies and training. The airport complex is secured and closed to the public in the evenings until 06:30 am.